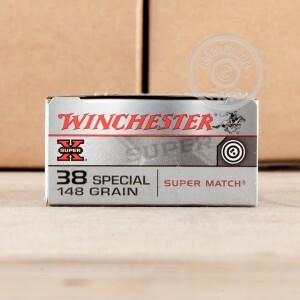 Target shooters will appreciate the accuracy and low recoil of this .38 Special ammunition from Winchester. 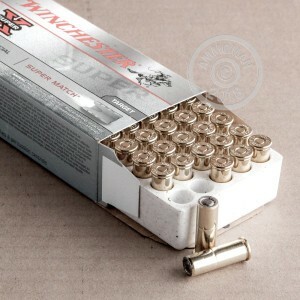 These cartridges fire a 148 grain flat lead wad cutter bullet that produces large, round holes in paper targets that are easier to see from the firing line. 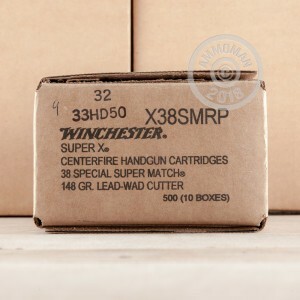 Each round in this box of 50 produces a muzzle velocity of 710 feet per second along with relatively mild recoil conducive to precise shooting. Winchester ammunition has been produced in Oxford, Mississippi since 2011. It uses non-corrosive Boxer primers and reloadable brass cases. Place an order for $99 or more at AmmoMan.com and get the whole thing shipped at no additional charge. You can cover a 5 shot group from 15 yards with a quarter. I shoot these rounds in my S&W 686 (no dash) 357, with an 8.375" barrel & iron sights.